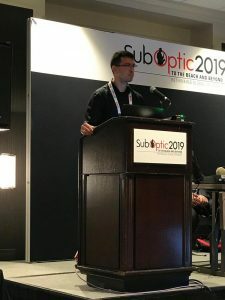 The AmLight team presented the collaborative paper “Mitigating soft failures using network analytics and SDN to support distributed bandwidth-intensive scientific instruments over international networks” at the SubOptic Conference 2019. The conference was held in New Orleans, LA on 8-11 April 2019. A triennial event, SubOptic is the longest running and most comprehensive conference series in the world for the submarine fiber industry. Abstract: With the consolidation of high-speed networks and worldwide scientific deployments, new experiments are being conducted remotely. The control and data gathering of these bandwidth-intensive mission-critical instruments require a reliable network infrastructure capable of reacting in real-time to soft failures, such as packet loss. To address the mission-critical real-time instruments’ Service Level Agreement (SLA), streaming telemetry and data-driven analytics are required. In recent years, the industry has created many open consortiums and specifications, such as OpenConfig and Inband Network Telemetry (INT). As a result, we have new levels of interconnections, interoperation, and disaggregation allowing Software-Defined Networking (SDN) applications to use protocol agnostic, common APIs, Artificial Intelligence and Machine Learning to create reliable and adaptive networks. This paper aims to present the ongoing effort to create an adaptive network infrastructure capable of identifying and isolating soft failures in an automated approach to optimize bandwidth-intensive data transfers. Our approach leverages the most recent solutions offered by the optical and packet layers using SDN and network analytics. For more details about SubOptic Conference 2019 click here.